Performance Summary allows brief previews of performance increase, robustness increase, valve travel, and valve reversal indices. Each index is a comparison of the current PID parameters and measurement filter compared to new values. The performance increase displays how much better the loop will respond to upsets. The robustness increase compares the sensitivity to process changes. Reducing valve travel and reversals will decrease wear and increase the life of the valve. This full suite of optimization tools allow analysis and tuning of PID loops in any industrial controller. 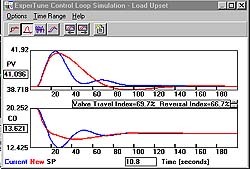 The software includes simulation, modeling, robustness, linearization, valve wear analysis, pH linearizer, time series analysis, multivariable, statistical and frequency response tools. ExperTune, Inc., 4734 Sonseeahray Drive, Hubertus, WI 53033. Tel: 262-628-0088; Fax: 262-628-0087.